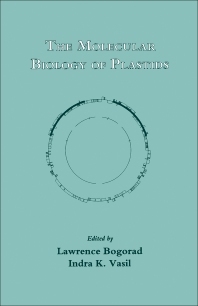 The Molecular Biology of Plastids: Cell Culture and Somatic Cell Genetics of Plants, Volume 7A deals with various aspects of plastid nucleic acid and protein metabolism. This book is organized into 10 chapters. Chapter 1 provides the introduction to the molecular biology of plastids, followed by a discussion of the maps of restriction endonuclease sites on chloroplast chromosomes in Chapter 2. Chapter 3 focuses on chloroplast gene transmission, while Chapters 4 to 7 describe the apparatus for nucleic acid and protein metabolism and how some transcripts of chloroplast genes are processed. The ribosomal proteins, ribosomes, and translation in plastids are covered in Chapter 8. The last two chapters consider the organization, operation, and transport of polypeptides through the outer plastid membranes. This volume is a good reference for plant molecular biologist, genetic engineers, and researchers conducting work on the molecular biology of chloroplasts. II. Endosymbiotic Origin of Plastids and Mitochondria: Serial or Simultaneous? IV. Single or Multiple Origin(s) of Plastids?